Where have the last three months gone? May 13th only seems like yesterday. It was a summer dominated for much of us by events in Russia. England won a penalty shoot-out and football nearly came home. The likes of Germany and Spain disappointed while the French eventually triumphed. But that’s all in the past. It’s been an interesting summer in the Premier League. Of last season’s top 6, Chelsea and Arsenal have new managers. Jose is still moaning. Spurs are yet to add to last season’s squad. Liverpool have spent a fortune. And, City are still the ones to beat. Elsewhere, Everton have spent £50m on a player who disappeared last season. Mike Ashley continues to be a favourite amongst the Geordies. Last but certainly not least, Colin is back! All of this and much much more should make for yet another rollercoaster ride which we call FPL! If you were so inclined to go back and re-read the Tips articles I wrote last season I’m sure you’ll find either Ederson or David de Gea, or perhaps both, were included in every article. I don’t plan on bucking the trend this week! At this stage last season I’d probably have tipped both, but in accordance with my desire to keep the article from turning into war and peace I’m only including one premium keeper. I’m going to stick my neck on the block and go with the Brazilian, Ederson. They finished last season as the top two keepers in FPL with de Gea claiming an extra 14pts. They could very well finish as the top two again this season, and de Gea could once again come out on top. However, the fact that Ederson is available for £0.5m less swings it in his favour. It’s also worth noting that the Spaniard made 57 more saves than the Brazilian last season and this would have been a boost to his overall points tally. Surely we will see an improvement from the United defence this season? This would then have something of a knock-on effect on de Gea’s points. It’s unlikely that this effect would be positive as it would take some effort to top 18 clean sheets. Hmmm…I appear to telling you why you shouldn’t pick de Gea rather than why you should pick Ederson! Let’s do something about that. As noted already, Ederson is available for £0.5m less than de Gea, despite finishing within 14pts of him last season. 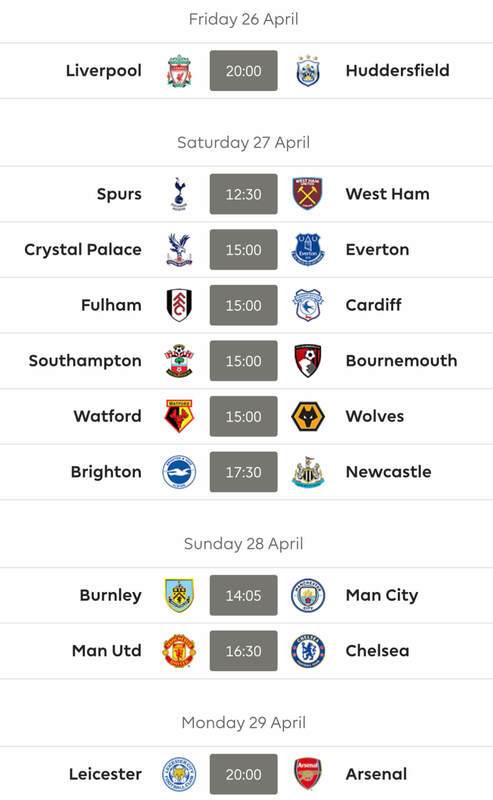 As Cookie pointed out in our Fixtures article earlier in the week, after a trip to face Arsenal in GW1 City follow that up with games against the three promoted team from last season as well as the three promoted teams from the previous season. These fixtures would beat the Daz doorstep challenge! So defensive coverage appears to be a must. But which defender? Pep has 4 centre backs to choose from and until we’re a few games into the season I wouldn’t feel comfortable picking one of them. Kyle Walker would appear to be the safest option from the back 4 but at £6.5m he’s £1.0m more expensive than Ederson. Benjamin Mendy is expected to get the nod at left back but is likely to be prone to Peptation? While he’s also £0.5m more expensive than Ederson. So there you have it. 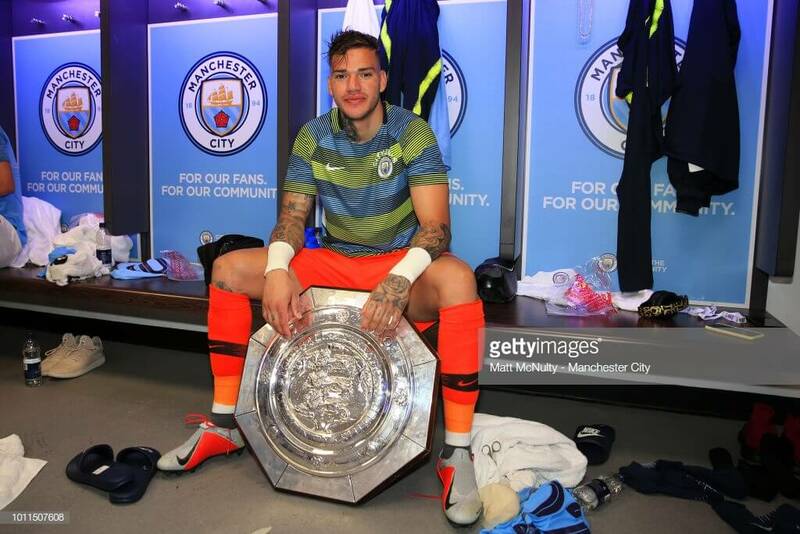 For those of you backing City to pick up some early season clean sheets all roads point to Ederson. Or do they?! That’s the premium end of things taken care of. Let’s now turn our attention to the budget options. Last season 11 keepers kept more clean sheets than Lukasz Fabianski. Despite this, the Pole ended the season as the 3rd highest scoring keeper in FPL. This success was due in no small part to the 137 saves he made, more than any other keeper in the league. Having just looked at the final table for last season I’ve noted that West Ham had the joint worst defence in the league. It looks like Fabianski will be busy again this season! However, there’s no denying that West Ham have strengthened over the summer and they also now have a decent gaffer at the helm. So in this regard I expect them to improve this season which could see Fabianski pick up a one or two more clean sheets. Elsewhere it’s something of a lottery! 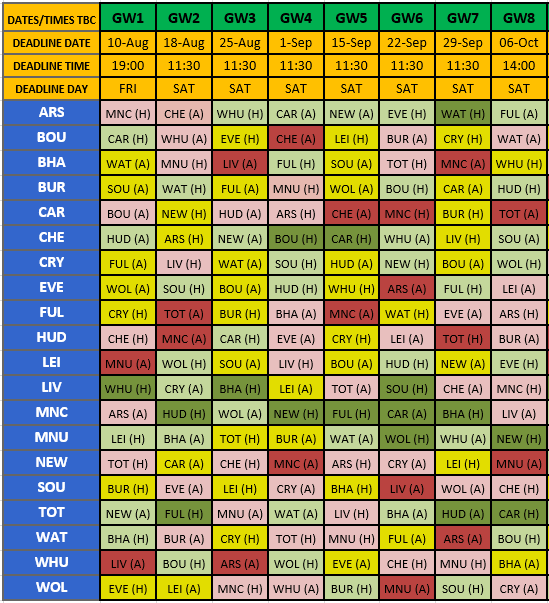 Palace have some decent fixtures over the opening game-weeks but it remains to be seen whether Guaita or Hennessy is first choice. Someone who does warrant some consideration though is Rui Patricio at Wolves. Wolves, along with Cardiff, had the best defensive record in the Championship last season, conceding 39 in 46 games. They kept a total of 24 clean sheets, 12 at home and 12 away. In Patricio they have signed a keeper with a wealth of international experience. 73 caps for Portugal, starting the last four international tournaments’ as first choice. His signing was indeed a coup for Wolves. 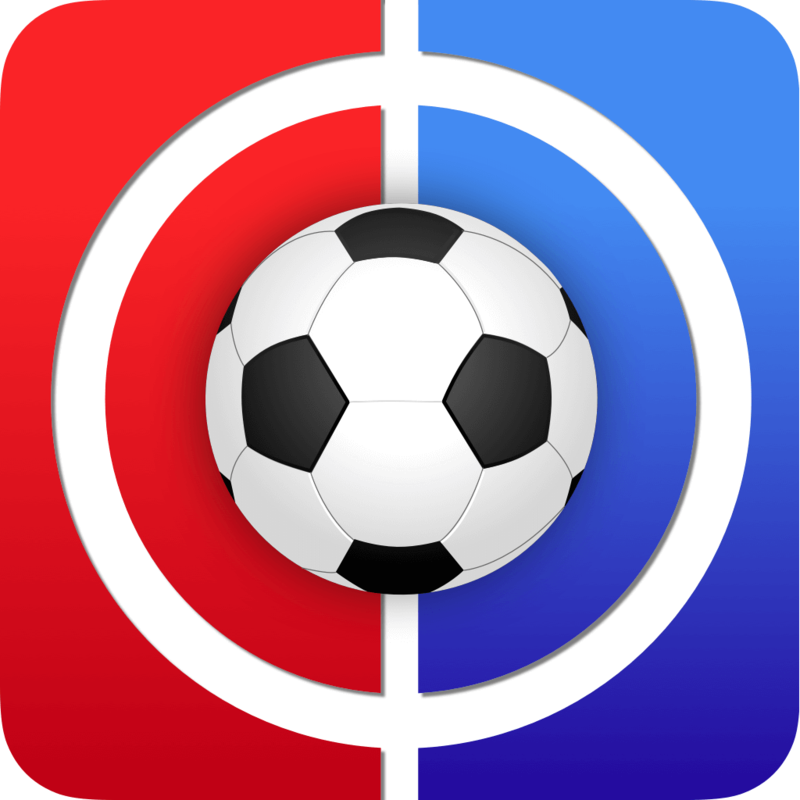 Aside from games against the two Manchester clubs Wolves have been handed a relatively straightforward start to life back in the Premiership and a couple of clean sheets could be on the cards. There are 19 defenders priced at either £6.0 or £6.5m, so there is plenty of options for those of you who appreciate what a premium defender has to offer. With these 19 options spread across five different teams I’m finding it hard to believe that my choice is Liverpool’s Andrew Robertson. Liverpool’s defence has provided many the comedic moment over recent years and as a result has come in for some much deserved criticism. However, they did manage to keep 17 clean sheets last season. Robertson was only present for 10 of these but it wasn’t until GW15 that he became a regular in the side, starting 17 of the next 18 league games. With the addition of Brazilian international stopper Alisson coupled with the arrival of Keita and Fabinho in midfield, the expectations are that Liverpool will show further improvements at the back. The Scot is defensively sound and has plenty to offer going forward. Only seven defenders bettered the five assists he picked up last season, a fact made more impressive when you factor in that he only made 22 league appearances. Four of these assists came between game-weeks 28-38 which emphasises how strongly he finished the season. It’s fair to say that Liverpool have had one or two talented Scots down through the years, and while it’s unlikely that Robertson will emulate these he will certainly give it his all. My intention was to only include one premium defender but the return of Benjamin Mendy to City colours in the Charity Shield has forced me to revise that. City paid somewhere in the region of £52m for the Frenchman last summer but injury curtailed his season to just three starts and a handful of appearances from the bench. As a result we have little to go on when tipping him. He did however pass the ‘eye test’ on Sunday and he also had some positive stats. He made 22 passes in the Chelsea half and had nine touches in the final third. Pep’s recent comments are also encouraging, “Last season we played without full-backs now we have for example Mendy. Mendy has energy to go up and down lots of times so we can attack a different way.” This suggests to me that we’ll see a lot of Mendy getting to the bye line and putting crosses/passes into the area. In his last season in France he averaged 1.6 crosses per game. The best in the PL last season was Jose Holebas with an average of just over 1.1 per game. Whether it’s at LB or LWB I suspect we’ll see quite a bit of Mendy this season. If you’re looking for a team with decent fixtures and a well organised defence look no further than Burnley. They finished last season with 12 clean sheets and the 5th best defence in the league. In their opening eight league games they face just one of last season’s top 6. The issue with Burnley is the Europa League. Typically it has a negative effect on a team’s league form. However, their involvement in the Europa is likely to mean that Burnley are one step ahead of many other teams in terms of their fitness and any dip in form is unlikely to come until they are involved in the group stages. That’s assuming they make the group stages. As we witnessed last season there is little to separate their defenders but my tip is Ben Mee. He led the way in terms of penalty area touches as well as attempts on target and was unfortunate not to find the back of the net. In recent seasons and again in the build up to the season ahead there has been a shift towards investing a larger portion of your £100m budget into the defence. Despite this, there will always be a place for a good budget defender. As always there is a plethora to choose from. But, for me, one stands out from the crowd. Crystal Palace’s James Tomkins. Tomkins was present for each of Palace’s nine clean sheets last season, a stat which is made more impressive when you consider he only made 28 appearances due to injury. He also chipped in with three goals and nine bonus points over the course of the season. Palace finished last season in impressive fashion with four clean sheets from their last eight games with Tomkins scoring two of his three goals in this period. Fixtures wise Palace have a great start to the season, only facing one team from last season’s top six in their opening nine games. Surely Tomkins is a good bet for a few clean sheets! Every year we search for the holy grail – a £4.0m defender who will start. Palace would appear to have provided us with the best option – Aaron Wan-Bissaka. The youngster has started five times in preseason and looks set to start at right back. Before we move on from Palace it’s worth mentioning Jeffrey Schlupp. The Ghanaian international has featured prominently on the left side of midfield during preseason and if this were to continue he would represent a fantastic OOP option. Mo Salah. Need I say more? Probably not, but for the sake of the article I’ll add a few words. The Egyptian finished last season with 303pts which was a staggering 74pts clear of 2nd highest scorer. Now there will be some folk who argue that he can’t reach the same heights he hit last season and is therefore overpriced but I’m not a part of that cohort. He had a staggering 282 touches in the penalty area last season, 53 more than the next best. Only Harry Kane had more shots on target. Ok, so I can’t guarantee that he’ll match those numbers this season. However, it’s worth noting the number of chances he missed last season. 23. No player missed more chances. Christian Benteke came closest with 20. This suggests that Salah did not have an unsustainable level of conversion and this just highlights the dangers of not owning him for GW1. There is the argument that Mane + Firmino will cover Salah’s points. I’m not sure I’d go along with this. If we look at this in very simple terms, we’ll see that Mane & Firmino brought in a total of 328pts last season which was 25pts more than Mo. Their combined cost is £6.0m more than Salah. Therefore, I suspect that Salah plus a £6.0m forward are more than capable of accumulating more points than Mane & Firmino. This is not to say that both Mane & Firmino are not solid picks in their own right. There is also the old chestnut about how a team looks more balanced without Salah in it. I’ll agree that it does. Nonetheless, what do you do if Salah starts the season on fire? You’re forced to take hits early doors or perhaps even wildcard. I’m a firm believer that it’s much easier get rid of him if he starts poorly. In that respect I’m surprised he’s only in 50% of teams! With the addition of Riyad Mahrez the City midfield has become even more of a minefield this season. You could make a case for at least 5 or 6 of them but I’m going to with the consistency which Kevin de Bruyne offers. For some reason the FPL decision makers decided to leave the Belgian priced at £10m. To give this some context Raheem Sterling scored just 10pts more than KDB last season and his price has increased from £8.0m to £11.0m. So what do we get for £10.0m? You get a player who scored eight and assisted 18 last season. A player who started 36 of 38 league games. And a player who made more key passes and created more big chances than any other player in the league last season. Granted he only returned to training this week so there is a possibility he won’t start against Arsenal on Sunday but it won’t be long until he’s once again a key figure in the middle of the park. Bernardo Silva might be worth an early season gamble! Against Chelsea on Sunday he played a little deeper than might be expected but this didn’t stop him picking up an assist and following the game Pep was full of praise for the Portuguese international. “The performance of Bernardo Silva was a masterpiece,” Guardiola said. “Everybody knows the wingers want to compete. Right now, it is Bernardo and 10 others. “Bernardo is far away from other guys, so that is why, at the moment, he plays.” It remains to be seen how long he will stay in the side but for now he appears to be a cheap route into the City minefield! That’s enough about the heavy hitters. Onto some mid-price options. Salah, Mane & Firmino are rightly grabbing the headlines at Liverpool but perhaps Naby Keita is worth some consideration. He scored 17 in 59 appearances for RB Salzburg before moving to RB Leipzig where he scored 14 in 58 appearances. If as expected Fabinho plays as the deepest of three midfielders Keita should be afforded the opportunity to get forward. Moving to the blue side of Merseyside and we have another new arrival in the shape of Everton’s Richarlison. The Brazilian had a season of two halves for Watford last season. In his first 13 games he picked up five goals and five assists. In the subsequent 25 games he picked up just three assists. He arrived at Watford last season on the back of having played close to 40 competitive for Fluminese, so perhaps it’s not a surprise he faded as the season progressed. Everton have had a torrid preseason but have some great early season fixtures and at just £6.5m the Brazilian could prove a bargain. In Diogo Jota Wolves have themselves an attacking midfielder who knows where the goal is. Granted the PL is a step up in class but he scored 17 times in the Championship featuring predominantly on the left of a front three. He also scored eight times for Porto the season before. Fulham’s Tom Cairney (£5.0m) could very well be the best budget option available. The arrival of Seri at Craven Cottage this summer could very well allow Cairney some more freedom this season. Having scored 25 goals over the past three seasons he certainly knows where the goal is. Cardiff’s Joe Ralls is their first choice penalty taker and is also available for £5.0m. He’s a favourite of Warnock’s which should see him start every game. If you need a £4.5m filler just make sure you pick someone who will start regularly. Brighton’s Dale Stephens is probably your best bet. Since FPL launched a number of weeks back there has been much discussion surrounding the games premium forwards. The general consensus appears to be that with Mo Salah costing £13.0m there is only space for one premium forward in our squads. But which one? Harry Kane has yet to start a game for Spurs since winning the golden boot at the World Cup in such scintillating style! There’s also the fact that August doesn’t like him. So we’re ignoring Kane for now. Romelu Lukaku is also ignored for now as he’s yet to feature for United. That leaves us with a shootout between Pierre-Emerick Aubameyang and Sergio Aguero. For me it was 50:50 between these two until last Sunday afternoon. 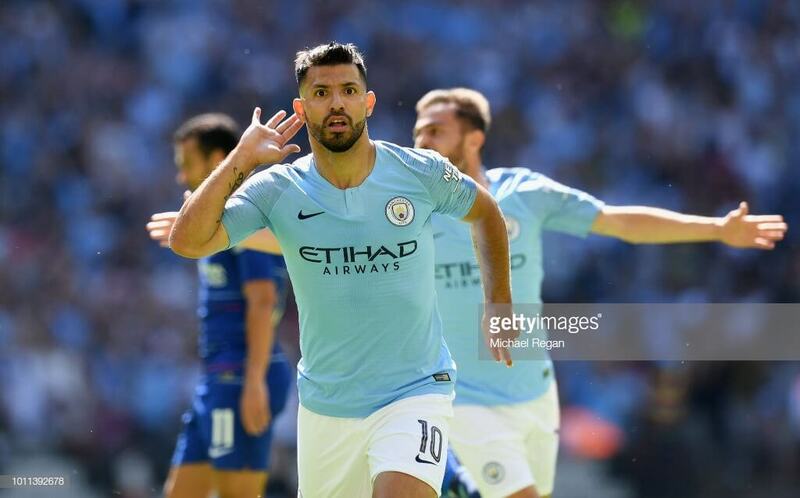 With two goals in the Charity Shield Kun confirmed that he is the go to premium forward for the opening weeks. Since his arrival in Manchester back in 2011 he has averaged an impressive 20 goals per season. Of course there will be rotation at City this season but for now Kun is ahead of Jesus in the pecking order, while I also believe he will be less prone to rotation when compared to Pep’s array of midfield talent with KDB probably being the exception. City’s opening fixtures scream goals goals goals, which in turns suggests points points points for Aguero. Just under the premium strikers there is a small bunch of strikers priced from £8.0m to £9.5m and for me the standout option is Liverpool’s Roberto Firmino. Granted the Brazilian has only featured for 90mins (2*45mins) in preseason but Klopp has suggested, “it should be possible but we will see”, for Firmino to feature against West Ham. He looked sharp against Torino in the 2nd of his 45min appearance, scoring one and creating one. 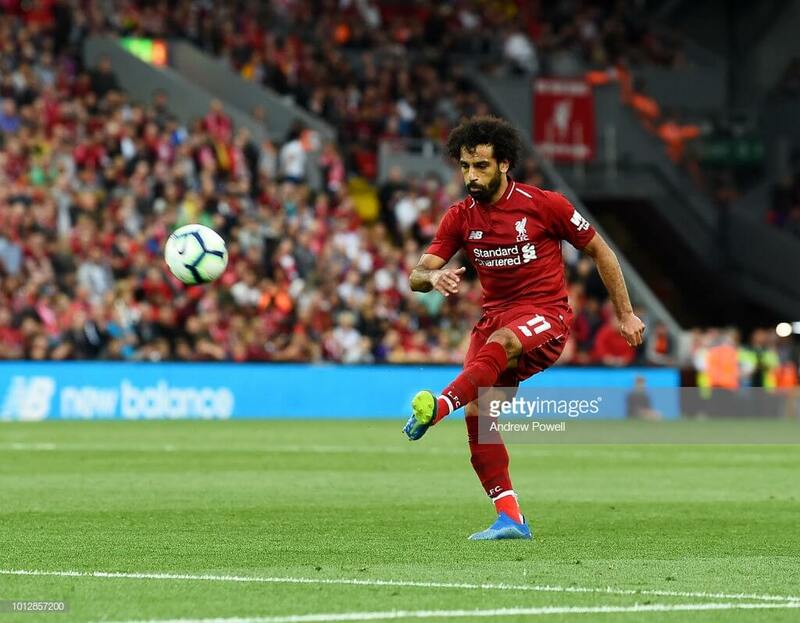 He had his best season in front of goal last season with 15 goals and eight assists and was the focal point of the Liverpool attack. He made more appearances (54) and had more starts (46) than any other Liverpool player last season and featured in all but one league game. It has been suggested that a resurgent Daniel Sturridge could have a negative impact on Firmino’s numbers this season but I would argue the opposite. Firmino ran out of steam last season scoring just twice in the last 10 game-weeks. Assuming Sturridge can keep himself fit (a big ask) he might allow Klopp to give Firmino the occasional rest which could work to his benefit. Next we have a whole host of mid-price forwards (£6.0m to £7.5m). These players are so priced because they have the potential to score well but have never done it consistently in the past. Unlike someone like Aguero they’re a gamble. Therefore my picks from this bracket are based on preseason form and early season fixtures. They are Crystal Palace’s Wilfried Zaha and Bournemouth’s Josh King. Zaha’s inclusion is based on the assumption he remains at Palace. Should he move on he becomes a wait and see option. Throughout preseason Zaha has played either from the left or behind the striker and should he remain at Selhurst Park he is likely to be the clubs talisman. As already noted above Palace have some great early season fixtures. Two seasons ago Josh King was a gift from the gods. A midfielder who scored goals and was less than £6.0m. He finished that season with 16 goals to his name. Last season brought a significant price hike and a reclassification as a forward. He only managed a total of eight goals last season but six of these came in the final 13 game-weeks. Eddie Howe has promised that Bournemouth will continue to play an attacking brand of football and with Bournemouth having some decent early season fixtures King could very well build on his four goals from preseason. Finally we come to the lottery that is the budget forward! We all dream of a Harry Kane (2014/15) or a Jamie Vardy of the same season. There are currently 28 players priced at £5.5m and below. Clearly there are plenty of options but I’m only interested in players who will feature regularly. At £4.5m I’d like to include Fulham’s Kamara but I have doubts over him starting. But at £4.5m does it matter if he only makes substitute appearances? Screw it. Let’s include Kamara. Cardiff’s Kenneth Zohore is priced at £5.0m and is expected the lead the line. He managed nine goals in the championship last season and 12 the previous season. For £0.5m more you can have Cardiff’s Bobby Reid who scored 19 times for Bristol City in the Championship last season. Sticking with the promoted sides you can have Wolves’ Raul Jimenez also for £5.5m. The Mexican has never been prolific but he has plenty of top flight experience in both Spain and Portugal. If Danny Ings leaves Anfield before the deadline he’s certainly one to keep an eye on. Injury has blighted his time at Anfield but in his only PL season prior to his move to Merseyside he scored 11 times for Burnley. Hi guys! Please rmt! I know it is a lot of attack compared to my defense, but what you think of that? Who do you think plays ahead of Bednarek? I understood that he was favoured pre-season. Of course that does not guarantee a place. Do you think it is worth selling Tomkins for a 4m defender to free up .5m, and promoting Wan-Bissaka to the starting team? Not overly keen on double Palace in defence! No I would leave it. I don’t really know if any 4.0’s are nailed apart from WB so wouldn’t downgrade to it. Cheers Matt! Happy with the rest of my team, just can’t decide on this! Have 1m itb to help with a probable week 3 reshuffle to bring in KDB for Silva. Ederson is only on the bench because of matchup. Hi Guys! Please help! Is it too much of a risk to leave Mendy out?